One day Paddington went to visit his good friend Mr. Grubar at his shop. They shared cocoa and caught up on the news. Mr. Grubar showed Paddington a vase. A piece had broken off. Paddington is a helpful bear and offers to get some glue and fix the vase. He carefully stows the vase in his basket with wheels. But on the way back, he notices a sign in the window of the barber shop. Paddington goes into inquire and takes a job sweeping up cut hair and generally helping out with the customers. "Bears are good at sweeping," says Paddington. "If you do well, you can try the clippers," Mr. Sloop said. Leaving Paddington to his broom and dustpan, Mr. Sloop ducks out for a quick cup of coffee. The barber shop is full of neat things--mirrors and chairs that go up and down, posters of many types of haircuts, fragrant shampoos and hair-grow tonics There is a white barber's coat hanging on the wall and Paddington just has to try it on. He is just trying out the barber's scissors, when a customer comes declaring that he's tired and in a big hurry. The man sat down in the barber's chair, and before Paddington could speak, he had fallen asleep! Paddington looks at the sleeping customer and then at the barber's clippers, plugged in and ready to go. How hard could it be to give the man a quick trim? What's worse than a bull in a china shop? Paddington Bear in a barber shop! 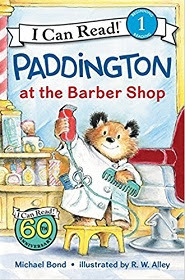 It's hair today and gone tomorrow, in Michael Bond's new I-Can-Read book, Paddington at the Barber Shop (I Can Read Level 1) (Harper, 2017), and you can bet that this bear finds a way to save the day for all concerned. R.W. Alley does the illustrating honors for Bond's famous bear-with-a-suitcase as he has done since the 1990s, with Paddington Bear as lovable and well-meaning as ever. Paddington is a bear with the best of intentions, but perhaps it might be good to give him some time off, so for primary students, pairing this one with Bond's earlier Paddington's Day Off (I Can Read Level 1) (Harper I-Can-Read, 2017). And for a terrific read-aloud bedtime book, introduce this quaint fiction series with the classic, A Bear Called Paddington by Michael Bond.